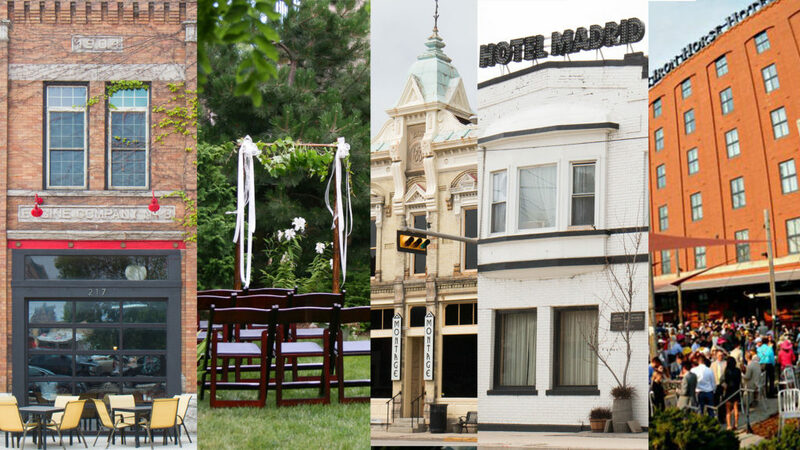 Walker’s Point, Milwaukee’s most historic neighborhood, has become Milwaukee’s hottest spot for wedding venues. For brides looking for that urban chic atmosphere, Walker’s Point venues can’t be beat. There are several old warehouses, garages, commercial buildings and even a fire house that have been restored to provide event space for parties from 10 to 250. Three of the newest event venues are LVL Events, The Ivy House, and The Cooperage. Six well known Walker’s Point venues include The Seeboth, South Second, Engine Co 3, Anodyne Coffee House, Hotel Madrid and the Iron Horse Hotel. Finally, for something more intimate and outdoors, Cream City Weddings’ own urban garden is a wonderful place to host your ceremony. It can accommodate up to 50 guests. The garden can also offer a unique reception experience when partnering with local food trucks, caterers and breweries. Most of these spaces give you that industrial urban look with brick walls and exposed beams. These venues all also feature the amenities and comforts you’d expect with more traditional venues. One thing to remember, these downtown venues often have limited parking, talk to your hosts about valet service or shuttle buses from hotels or other locations. Some of these venues include and are well known for their food and catering. For the others, review their preferred vendors. Caterers on this list will know the venue and be trusted professionals helping you create the perfect day.